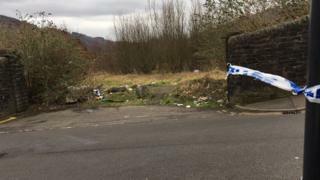 Police are treating the death of a woman whose body was found on land near a wooded area in Rhondda Cynon Taff as unexplained. Officers were called to a site near the Duffryn Street, Mountain Ash, at about 13:00 GMT on Tuesday. No details have been released about the woman but the circumstances surrounding her death are being investigated. South Wales Police has appealed for anyone who has any information about what happened to call 101.